With four home runs last night in a 7-2 win over Seattle, the Yankees are on pace for 273 home runs this season, which would top the MLB record set by the 1997 Mariners. “Everybody here can hit,” Miguel Andujar said. Indeed. 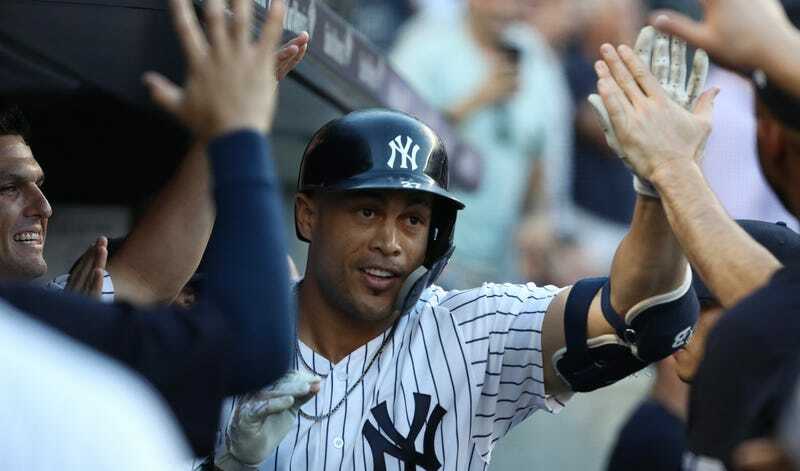 Giancarlo Stanton (who may or may not have changed his stance), Andujar, Aaron Hicks, and Gleyber Torres went deep as the Yankees reached 118 dingers in just 70 games. That pace ties them with the 2000 Cardinals, who finished with 234, and is behind only the 1999 Mariners, who finished with 244. Neither of those teams could keep up the pace, though. The ‘97 Mariners, featuring Ken Griffey Jr., Jay Buhner, Edgar Martinez, and A-Rod, hold the record with 264 jacks. It’s going to be a close thing, but many more four-homer games (the Yankees lead the majors with seven this year) will help. And then there’s Gleyber Torres, who was called up three weeks into the season and already leads all MLB rookies in home runs and RBI. Torres hit his 14th home in his 50th game, tying Aaron Judge for the third fastest in franchise history, trailing only Gary Sanchez and Kevin Maas. Meanwhile, only Joe DiMaggio and Mickey Mantle have hit more home runs as a Yankee in a season at age 21 or younger. Good company (uh, except for Kevin Maas). So, the Yankees can hit. And their bullpen is potentially historically good, sporting the best strikeout rate and the fifth best mark in opposing batting average in the live-ball era. That leaves the obvious weak spot, the starting pitching—though the rise of last night’s winner, Domingo German, alleviates that worry somewhat. But it’s still a worry, because home runs tend to trail off in October, and because the entire season could come down to a single game. The Yankees lead Boston by just one game, and with the Mariners only two back of red-hot Houston, two of the four best teams in baseball are likely headed for the wild card play-in game.